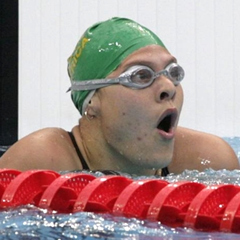 Johannesburg - South Africa's multiple paralympic champion Natalie du Toit is aiming for an astonishing seven golden medals at the London Olympics when she jumps in the pool for her last major international event. The 28-year-old from Cape Town, whose story of courage in the face of a major setback has inspired millions, will take part in seven events in her third Paralympics. Together with Oscar Pistorius, the "Blade Runner" who became the first double amputee to compete in the Olympics when he ran in the 400m heats this year, Du Toit forms the backbone of South Africa's 62-strong team heading to the British capital. She is aiming to go out with a bang, performing in the 50m, 100m and 400m freestyle, 200m individual medley, 100m backstroke and two categories in the 100m butterfly. Du Toit has been preparing since last year at the International Paralympic Committee (IPC) Swimming World Championships in Eindhoven, the Netherlands, last year. "London 2012 will be the end of my swimming career," she told the IPC magazine The Paralympian in an interview published in January this year. "The reason I did all of the events at the World Championships in Eindhoven was because I want to do all the events at the Paralympics." Du Toit started competing internationally as 14-year-old able-bodied swimmer, representing South Africa in the 1998 Commonwealth Games in Kuala Lumpur, Malaysia. Determined to overcome this obstacle, she was back in the pool three months later and training before she could even walk again. In 2004 she swam for South Africa at the Paralympics in Athens and won five gold medals and a silver. Today she tackles her last Games with 10 gold medals behind her name, having won a further five in Beijing and carried the South Africa flag in both the Olympics and Paralympics. Du Toit made history at the 2002 Commonwealth Games in Manchester by becoming the first para-athlete to qualify for the 800m freestyle final for non-disabled swimmers. She finished eighth. She then became the first-ever amputee to qualify for an Olympic event when she swam in the 10km open water race in Beijing. She was however disappointed with her performance, having finished 16th out of 24. Her achievements have earned praise and admiration from around the world, including from South African icon Nelson Mandela, yet the swimmer stays disarmingly down to earth. Her bubbly personality has made her popular with fans and journalists alike - and her story inspires many. Du Toit holds a degree in sports management at the University of Cape Town, her home town, regularly performing as public speaker and sharing her story to encourage self-confidence in others. This passion is reflected in the motto on her website: Be everything you want to be. The swimmer was awarded the Laureus World Sportsperson of the Year with a Disability in 2010 for "breaking down the barriers between disabled and able-bodied sport". Another passion is education, like her campaign to reduce drowning in South Africa and teach children to swim - and there is little doubt she will bring the same commitment and determination to it. "I've achieved everything I want to achieve (in swimming). Now it's different dreams and different goals," she told the BBC in a 2010 interview.